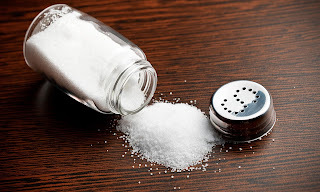 Numerous randomized trials and observational studies have demonstrated a direct relationship between dietary sodium intake and blood pressure (1,2). Although the effect is strongest among those with hypertension (3), there is also a smaller but consistent effect of lowering sodium on blood pressure among those with high normal or pre-hypertensive blood pressure levels. The DASH-Sodium (Dietary Approaches to Stop Hypertension) trial, a dose-response trial with 3 levels of sodium intake, found a significant direct relationship between sodium intake and blood pressure levels that was evident among subjects both with and without hypertension (4). A recent Cochrane meta-analysis of data from 35 trials (1) found that a 100 mmol reduction in 24-h urinary sodium led to a reduction in systolic/diastolic blood pressure of 5.4/2.8 mm Hg among hypertensive individuals and 2.4/1.0 mm Hg among normotensive individuals. How well this blood pressure reduction translates into a beneficial effect on incidence of cardiovascular disease (CVD) and particularly on total mortality remains controversial. A report from the Institute of Medicine in 2013 (5) found that there was a link between excessive sodium intake and risk of CVD, particularly for stroke. However, that report also found that the evidence for the effects of sodium intake below 2,300 mg/24 h was inconsistent and inconclusive. Few studies have available data in this range of sodium, and several that did report outcomes associated with these levels suffered from limitations due to reverse causation, possible confounding, and measurement error (6). Since that report, additional observational studies (7,8) and a meta-analysis (9) have reported an increase in cardiovascular disease and mortality among those at the lowest levels of sodium intake, suggesting a U-shaped relationship between sodium and health outcomes. In contrast, data from 10 to 15 years of post-trial follow-up in TOHP (Trials of Hypertension Prevention) participants identified a direct linear relationship between average sodium excretion and CVD down to the lowest levels of intake (10). Unlike other reports, this last study used a gold-standard assessment of sodium intake based on the mean of several 24-h sodium excretions accrued over 1.5 to 4 years of exposure ascertainment. In the current paper, we report the relationship between sodium intake and total mortality during more extended follow-up through 2013, for a total of 23 to 26 years. We include results from analyses based on both the exploration of later effects of the randomized sodium reduction interventions in the TOHP trials and the observational relationship between average 24-h sodium excretion in those who were not randomized to an active sodium intervention.